I will always remember Monday 14/09 as the day I almost got an exclusive interview with Cory Doctorow, entirely by chance. Update: The first audio recording is now back. Sorry about that, and thanks for the patience. Cory Doctorow. Veslebror ser deg in the front. Licensed CC BY-SA 2.0 by NRKbeta. 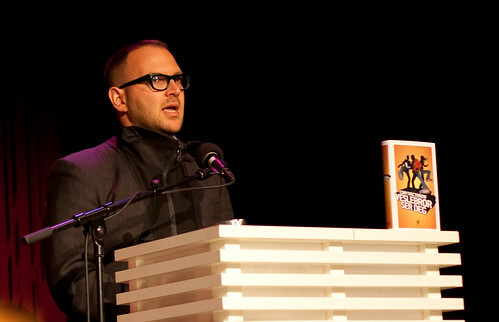 In connection with the translation of his latest novel, the brilliant Little Brother, into Norwegian («Veslebror ser deg«), Cory Doctorow hopped on a plane and flew to Norway. Here the Norwegian publisher of Little Brother, Samlaget, was planing two gigs for him: First a meeting with school children at 13:00, and then a debate at 19:00. Meeting with school children was a great idea, since that’s who the book is for, and it’s crucial for our future that young people get more aware of the threats on our freedoms that Little Brother talks about. The problem was just that Norway had the audacity to arrange an election on the same day, and thus all school children had the day off. Samlaget became aware of this only a short time in advance, so they didn’t have much time to announce that anyone could come.